Kenjutsu is a famous sword fighting martial art used in ancient Japanese Samurai classes. This martial art was very popular in the 15th and 16th century. Kenjutsu has no point system or restriction during the fighting. This martial art is more than a simple swordplay. You can say that is has a ritual and history with some precise kenjutsu techniques. While practicing this martial art, you need to maintain between the traditional techniques and constraints of the modern applications. What Are the Fighting Postures? There are five fighting postures. These are sword held to the side, sword held overhead, sword pointing to the horizontal, pointing to the down, and middle thrust. All these postures are linked in a chain and enable the user to follow any posture depending on the condition. These postures are known as the basics of kenjutsu training and conditions. You need to master these postures if you want to master this martial art. What Are the Quick Strikes? You will find a number of quick strikes. In one strike, one hand will remain on the pommel of your sword and your other hand should rest on the ridge of the blade. There are different types of hand postures to enable the users to take quick strikes with their sword. You can take quick strikes from different types of starting positions. For quick strikes, the target areas are collar, wrists, groin, and neck. These strikes strengthen your wrists, forearms, and muscles. Also, it will boost the overall speed and hand-eye coordination. The sword thrust is the key technique. The strategy is to lure your opponent into the ill-timed strike. Draw the attention of your opponent and then apply double-handed forward thrust by targeting his face or chest. Kenjutsu thrusts are followed by false strikes or circular motion to move the blade of opponents. Before sheathing, you need to clean your blade. For this, you need to circle your sword in front of you and then slide point crosswise the opening of the sheath. You can also slide your blade into the sheath using your right hand and then move the sheath over the blade using your left hand. What is Double Sword Technique? Yes, if you want, you can also fight with two swords. Some practitioners are able to do it easily. 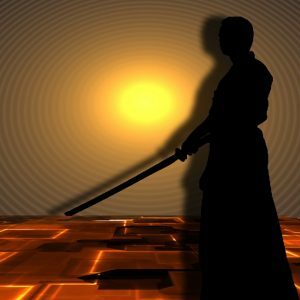 This technique is popularized by a renowned practitioner, Miyamoto Musashi. If you fight with two swords in two hands, it will double both your defensive and offensive capabilities. However, you will need intense training to practice double techniques. In double sword, you will use one to block your opponent strike and another for cutting and thrusting. Now you know different types of kenjutsu techniques. You just need intense practice to master this art. If you want to practice double sword, then there are various sword clubs you can join to better your knowledge and skills.